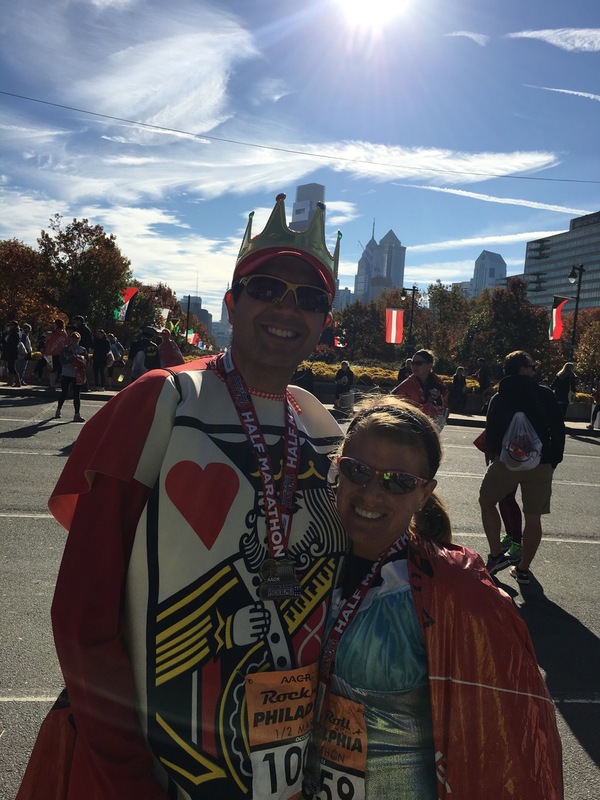 On Halloween my wife and I ran the Philadelphia Rock ’n’ Roll Half Marathon. 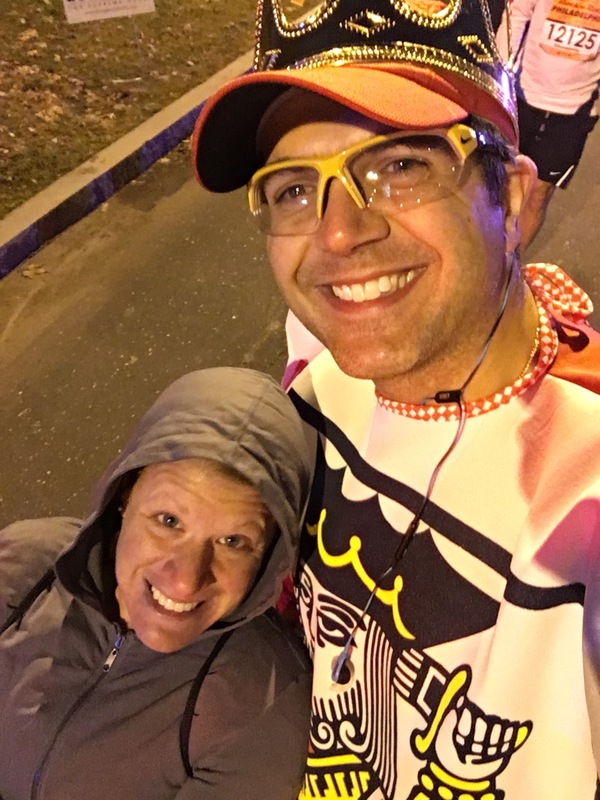 This is a race I have run since 2011 and my wife and I have run together since 2012. Every year we seem to say to each other that we should probably skip this race as we have done it so often but somehow we always find a reason to sign up. I will point out that we have already signed up for 2016 thanks to a $50 registration offer that was emailed to us the day after this race. What can I say, I guess this is going to be part of our annual plan going forward. 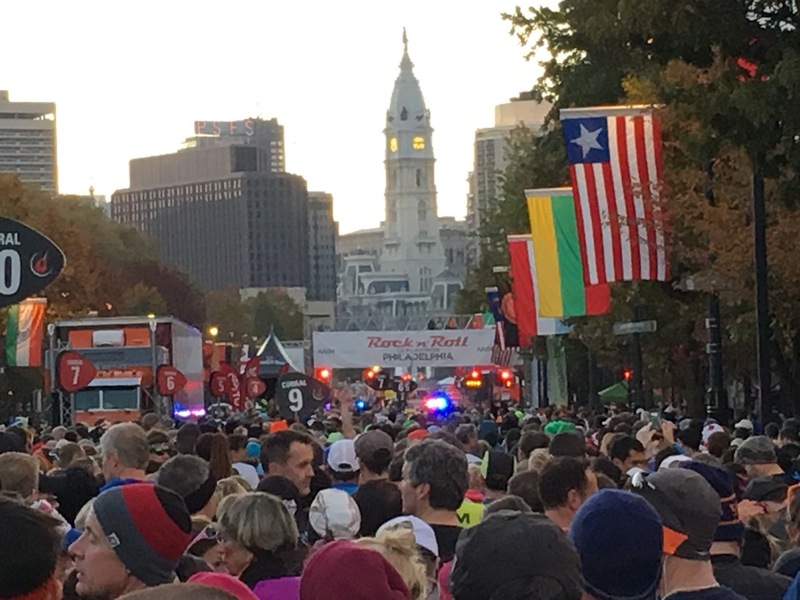 What was different about this year was the actual event date moved from mid-September to October 31st due to Pope Francis’ visit to Philadelphia falling on the usual race weekend. 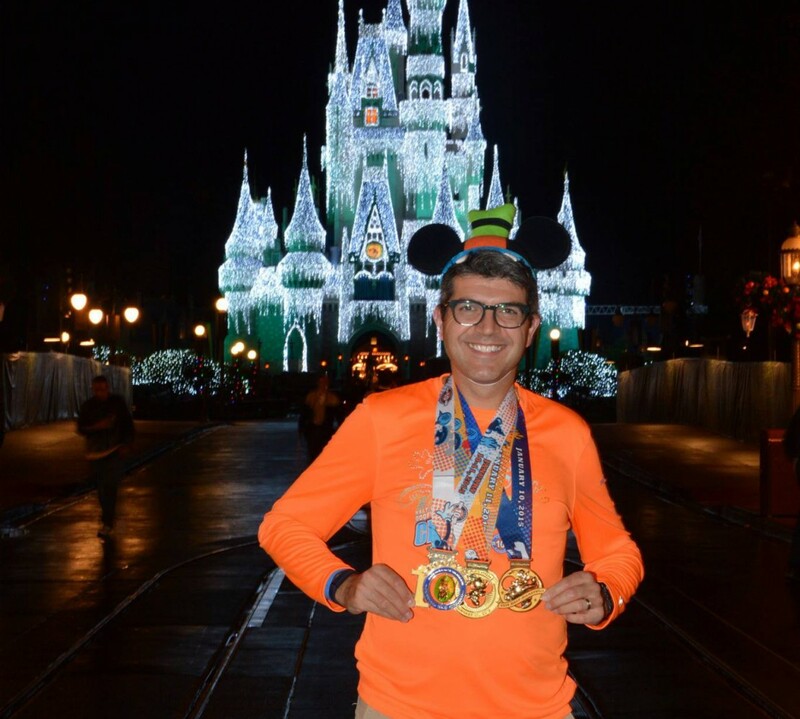 I guess he has priority (although judging from the pictures when he was here there were far more port-a-potties for that event than the half marathon!!!). 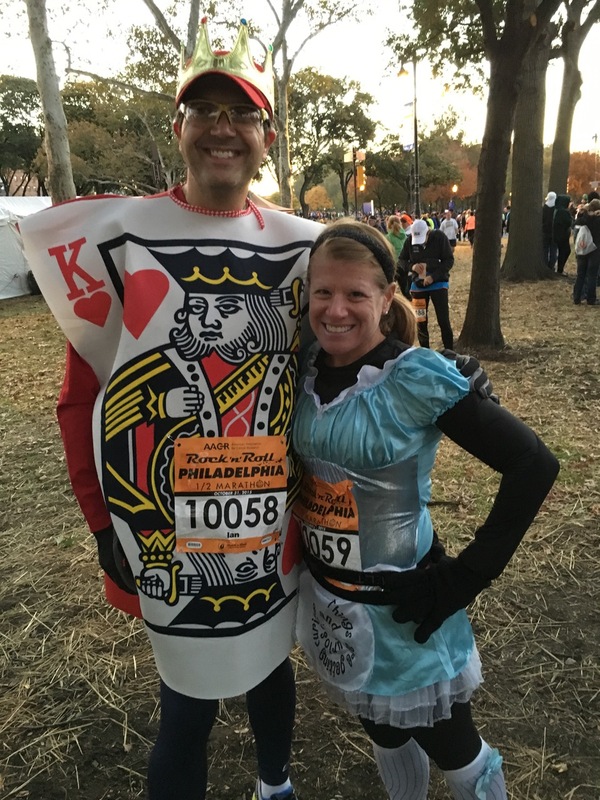 With the race falling on Halloween that was just another excuse (should we really need it) to run in costume. We were unable to attend the expo this year as the race fell on a Saturday and not a Sunday as was always the case on the original dates. My father in law was kind enough to go down to pick up our bibs and race packets on the Friday when we were at work so that was a big help. It’s tough for people coming from out-of-town to do packet pickup for a Saturday race especially of there is no general race day pick up option. They did offer a $30 day of race option but that was limited to 750 participants (out of the 15,000 expected). Another change in the event was the course this year. On the same day that the race was taking place, Temple University were playing a football game against Notre Dame University. ESPN hit town and they had set up around Independence Mall with an all day pre-game show. 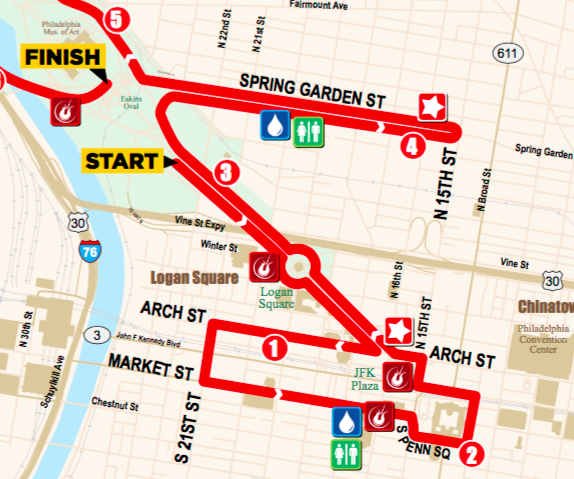 The course traditionally (well at least since I’ve been running this event) takes you down past Independence Hall and back up through China Town (behind the Convention Center) up Arch street and back up to the Art Museum. This year the course had to be changed and I hadn’t really taken notice of this until my father in law pointed it out the night before the race. 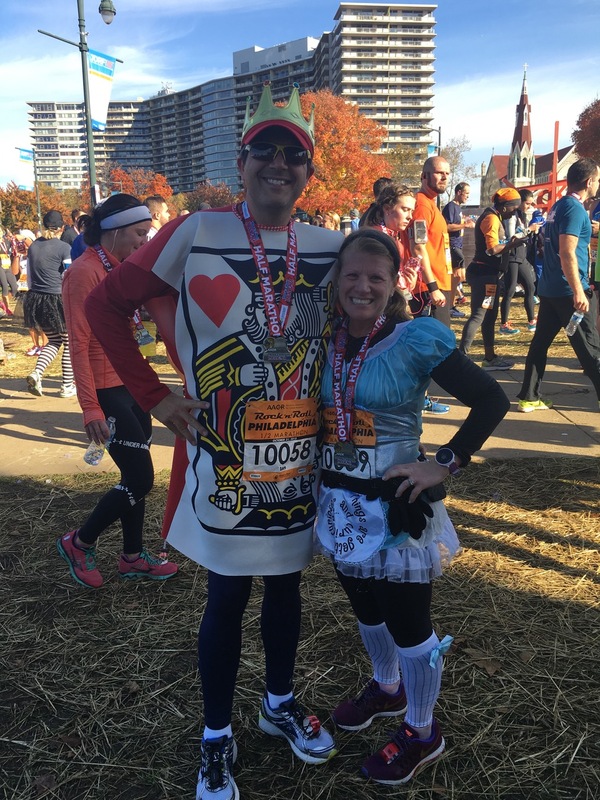 My wife and I had just completed the Marine Corps Marathon the Sunday before which had been a little rough for us, so heading straight into a half marathon was a little unnerving. 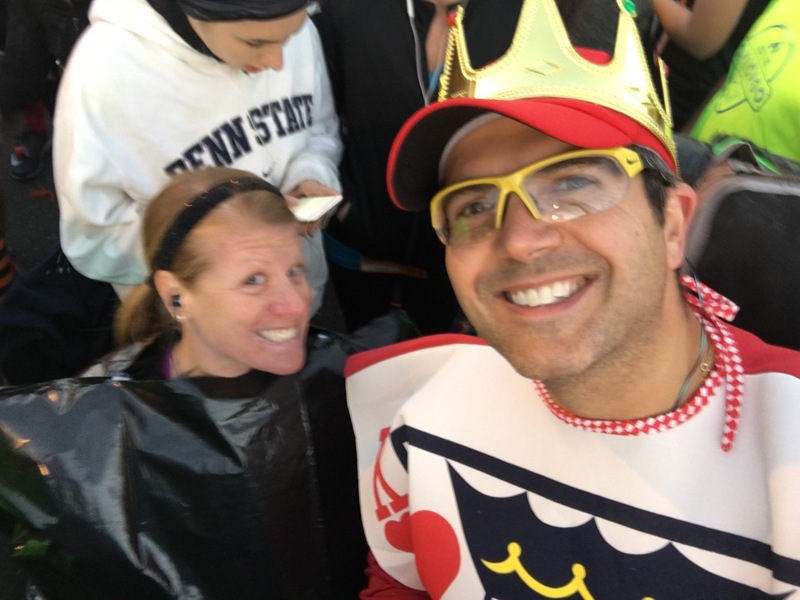 Don’t get me wrong, my wife and I had done the Goofy Challenge earlier this year but the difference in that event was that we were feeling great. We struggled the week before during the Marathon. I had realized that my issue was self-inflicted (shoe laces too tight) and I had some nice recovery runs during the week but I was concerned about my wife and how she would hold up. 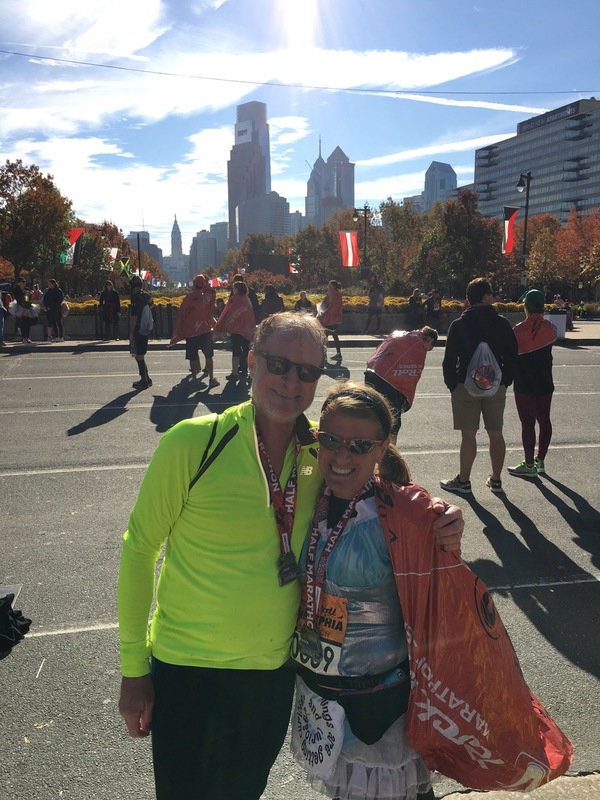 On race day we picked up my father in law around 5:15am and drove into Philadelphia. We made pretty good time and parked in my usual spot, a parking garage a couple of blocks away from the Art Museum area. 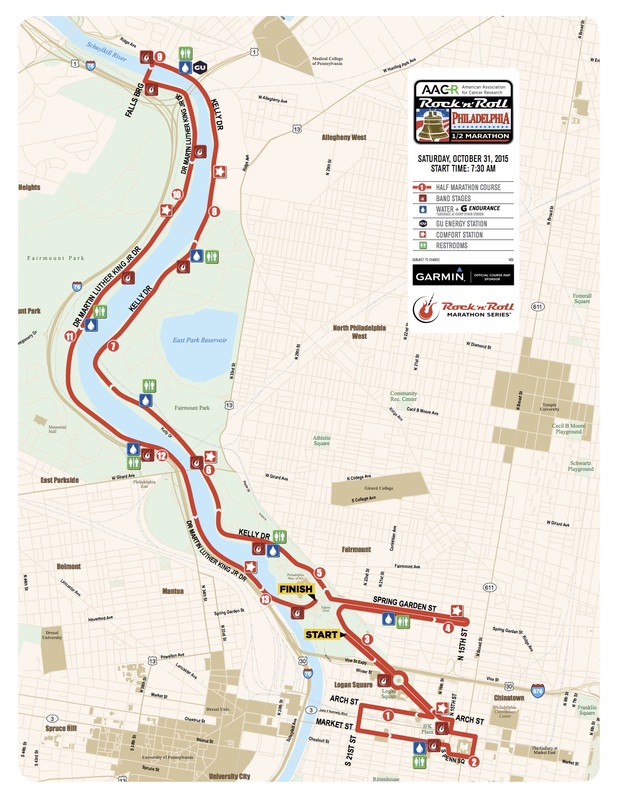 It’s about a 10 minute walk from the parking garage to the pre-race area. We arrived just after 6am and my wife refused to get out of the car. I guess she was still tired from her recent trip to California and also still in recovery mode from the previous weeks marathon. My father in law also chimed in and said we didn’t have to be the first people there. Around 6:30am I turned the engine off and reminded them that Rock ’n’ Roll are notorious (at least from my experience and some friends experiences) for being very short on providing port-a-potties. Why take the risk? 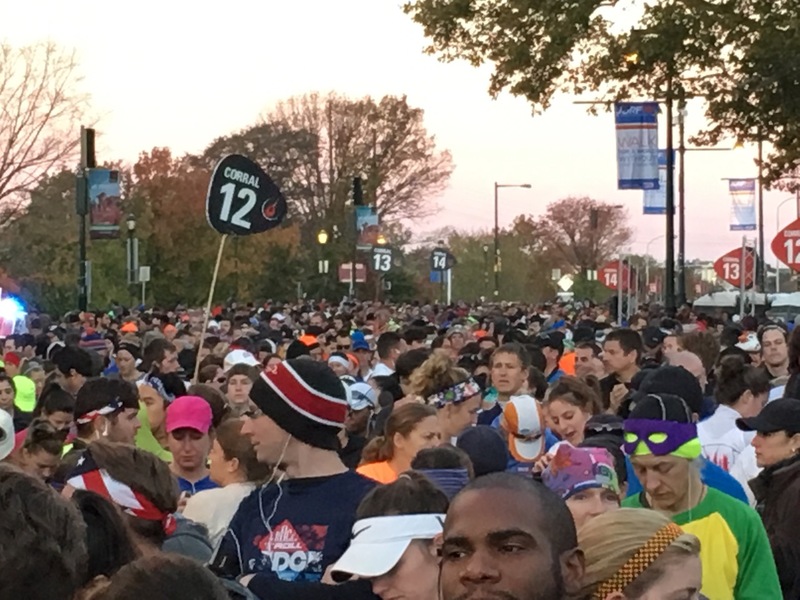 Last year there were long lines and this is always a big race packed into a small starting area. Making our way to the starting area. Still the middle of the night if you ask my wife. Partial costume reveal while my wife is trying to stay warm. 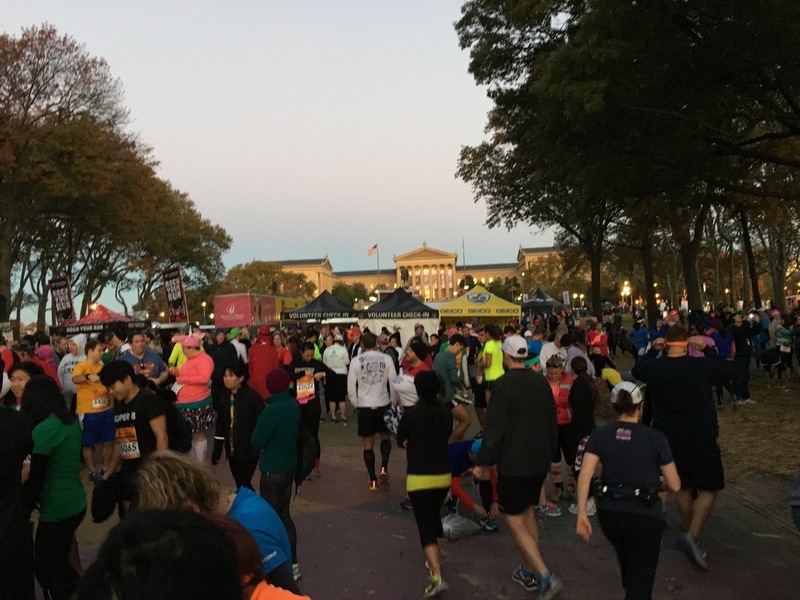 As we got closer to Eakins Oval where the race started and finished it began to brighten up and we immediately got in line for the bathrooms and then on to bag check. It was a little crowded but we were able to have a bathroom break and gear check done and we went over to one side to stretch before the run. As it happened, we were not hanging around too long. We had just finished stretching when we saw a whole bunch of folks sprint past us. People took a quick look and asked who they were. I noticed that they had different bibs from ours and I realized they were the elite athletes who were being transferred from their warm tent somewhere to the front of the corrals. Sure enough, as soon as they passed us we started to hear the National Anthem being sung. We were not even in our corral yet. I was surprised how little time we actually left ourselves pre-race. Not my style really. I’d rather be there early than stress out. We were in corral 10 and my father in law was in corral 22 or 23. We got into our corral and couldn’t see how far back my father in law had to go, so we pulled him in with us. 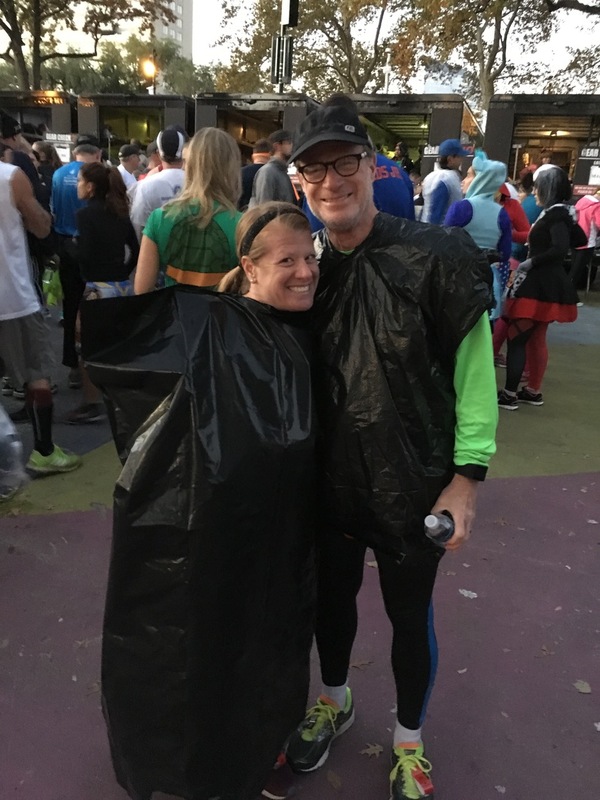 No-one was checking our bibs and he was still wearing a trash bag. Listen, I’m sure he wasn’t the only one in corral 10 who was supposed to be further back, but as I’ll get to later it worked out well. That’s a lot of corrals behind us. I knew there are bunch of people from my running team (the Mickey Milers) in this event and as it was a local race for us there were plenty of other people we knew who were running the event but it was so crowded and we had very little time before the race that we ended up not seeing anyone 😦 although I did bump into Sarah and Matt pre-race which was nice. I got to wish them congratulations on their recent engagement. The race announcer was British and his name was Ian. I liked him for some reason. Anyway, it was soon our time to go and we wished each other a good race and went off on our way. I knew early on that the course had changed because there were a tight turn to the right within the first mile. I hadn’t seen the new map but I actually preferred the new route to the event this year. As we could not run down to Independence Hall we now took a route up John F. Kennedy Boulevard and turn back down Market Street before rounding City Hall. 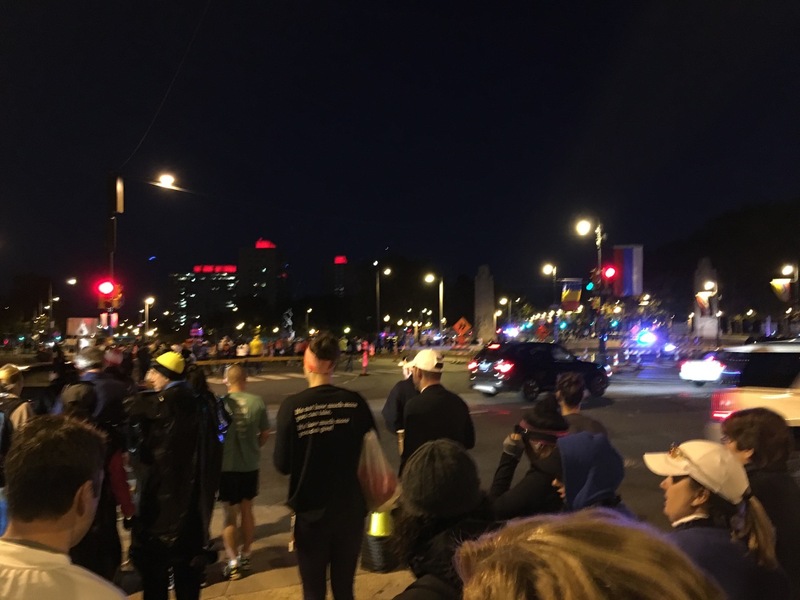 In previous years were would have started off similarly but we would have gone down towards Independence Mall and then turned left to go behind the Convention Center. Here the roads are pretty narrow and there are cobble stones (I recall) and some tight turns. The new course took full advantage of the wide streets around City Hall and after the loop around took us back towards the starting area. Normally we would be hitting the starting area around mile 5 but we had just reached mile 3. They were still releasing the corrals as we passed by. I think it was number 22 at this point and there were more to go. Wow. What a long wait. I’m glad we pulled my father in law in with us. He would have still been waiting to go as we were already 5K in. I was intrigued as to where they would get the extra mileage from as the loop around the East River and West River Drives is 8 miles. As we approached the Art Museum we took a right hand turn up Spring Garden Street which turned out to be an out-and-back. It was a nice gentle uphill with wide areas on both sides of the median. I actually enjoyed this so much better than the old course. I hope they decide to keep it. We ended up back at the Art Museum at the 5 mile point and from there the course would be the same as previous years. 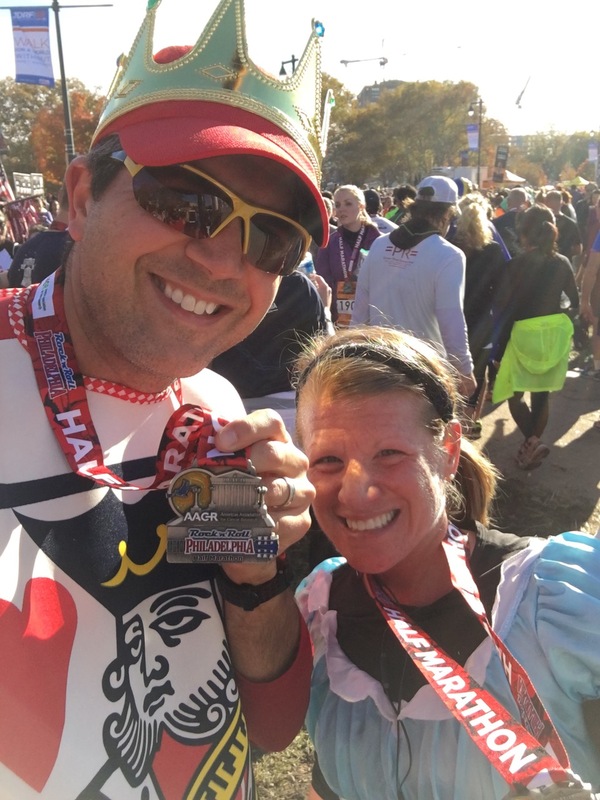 With the new course, the great temperatures (now that the sun was up) and the fact that the streets were wide (one of our complaints from the prior weeks Marathon) my wife and I were actually running a decent pace. Where we had both struggled last week it seemed we were different people. It did help that our costumes were getting us a lot of shout outs from the spectators. It’s good to be the King. We had a very enjoyable run from mile 5 to 8 up to the Falls Bridge. I mentioned that I was looking forward to hearing the rocking bag pipes band that we had seen every year and just as I said that we saw that they were just getting on the stage we were passing. Sadly, we were too fast this year to hear them!!! The race at this point was no different from prior years. The course was the same. 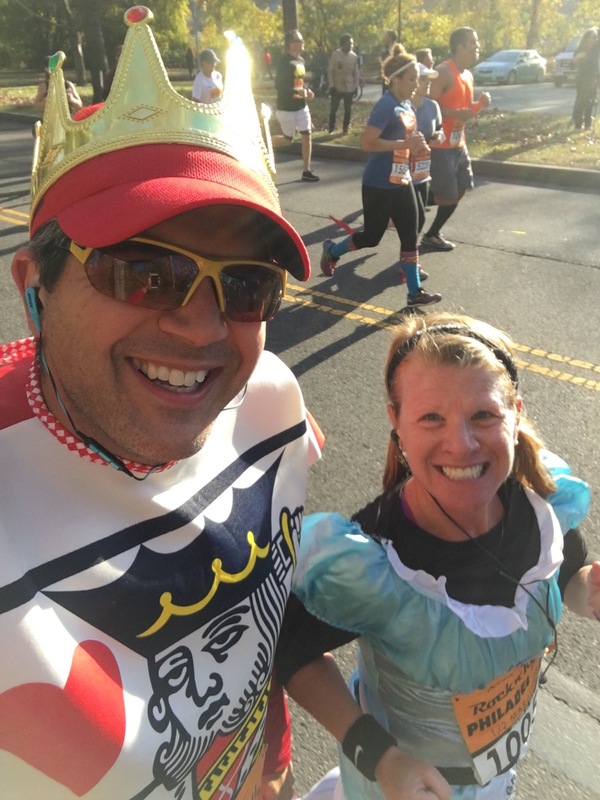 The only difference was that with the timing of the race being in October it was much cooler and less humid than prior years (note – it is back to the original time period of mid-September in 2016) and that there were plenty of people running in costume which was fun. Some were very creative although this was not a runDisney event where you see many people run in costume. For some reason we saw a lot of ‘Waldo’s’ so it wasn’t really hard to find him at this event. The other major difference was that we were kicking it!!! 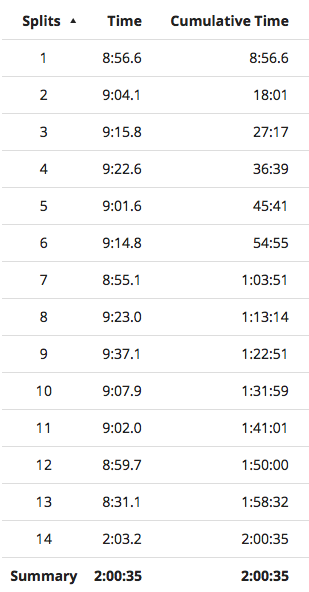 I ran this race in 2011 and this was my first sub 2 hour marathon. The course is fairly flat and fast. We have run as a couple every year from 2012 and run anywhere between 2:02 and 2:06 together. We were looking at being close to 2 hours at our current pace as long as we could hold it together. 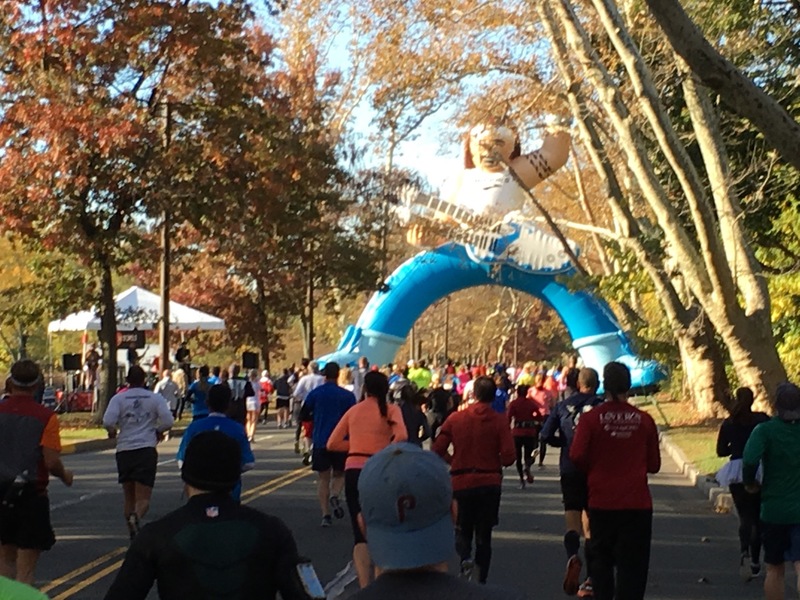 Seeing the ‘Rocker’ towards the last 5K of the course. He’s a lefty. Enjoying our little costumed run. With the last couple of miles ahead we focused on our pace. I think my wife was a little uncomfortable. I know she was having a hard time running directly into the sun the last few miles and regretted not bring her sunglasses. Something to do with them not matching her costume. That’s dedication. Me? Sunglasses always…I couldn’t look any worse. 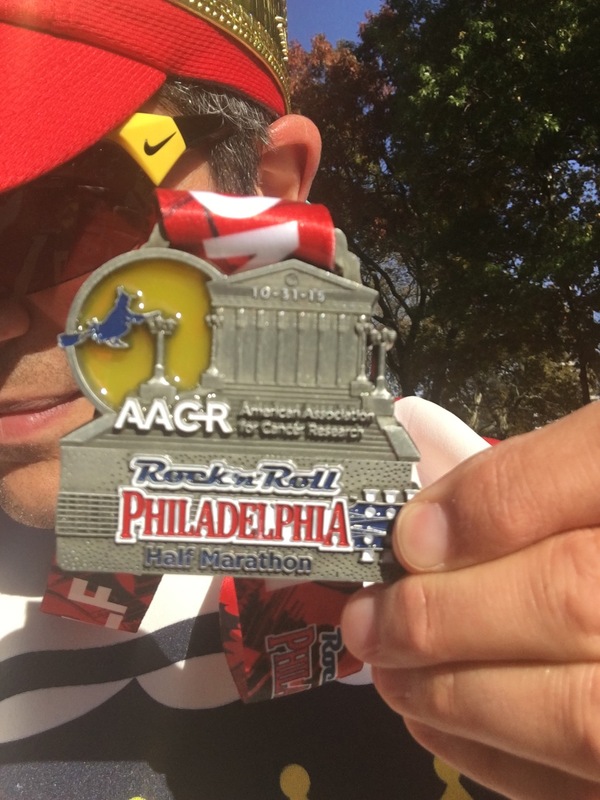 If you haven’t ever run this race before, the finish line is at the bottom of the steps of the Philadelphia Museum of Art (think Rocky). However, the last 0.2 miles are uphill. Very uphill. Yup, we had to power up the hill but we did and crossed the finish line together again. We just missed out on the 2 hour mark with a final time of 2:00:35. So close. Considering how we ran the week before I thought this was an awesome time and we both felt very good so that’s what was great about our final time. With our medals after crossing the finish line. As we made our way out of the finish line area and back to the post run finishers festival we saw two runners who passed us in the last couple of miles. I know there was a costume contest as part of the event and if they were entered I truly hope they won. 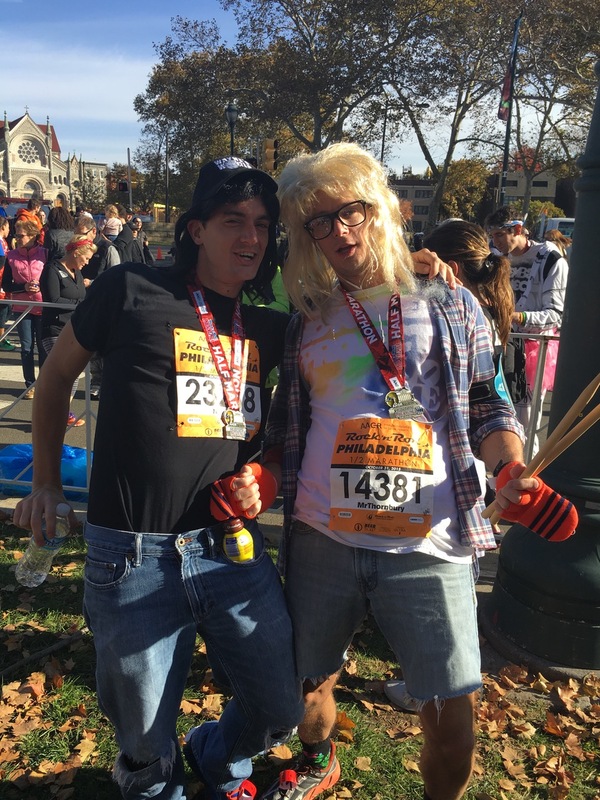 Awesome costume…especially running a half marathon in jeans!!! Party on Wayne and Garth!!! There are always lots of food choices post race but by far my favorite is the chocolate milk. So glad they have this at the finish line. Good stuff. We went over to pick up our bags and stretch out a little. It wasn’t too long after that my father in law came over. 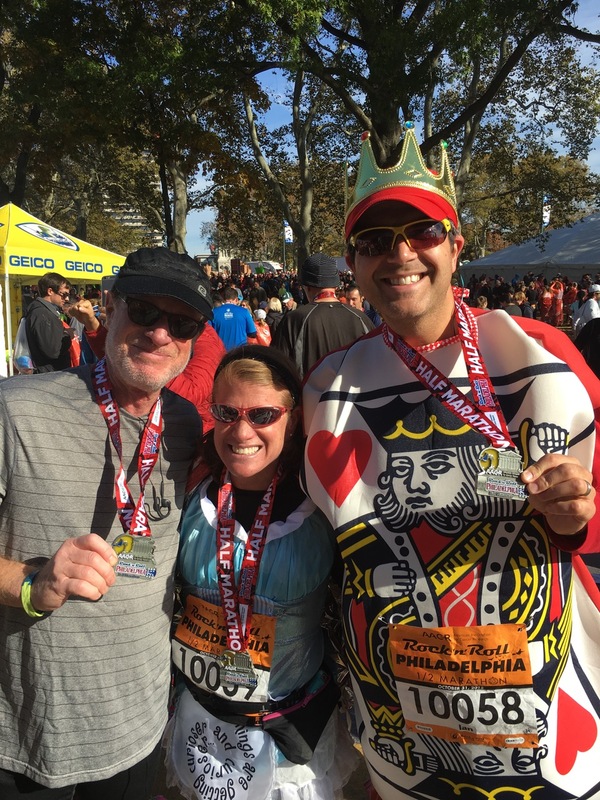 He ran a 2:23 half marathon. I guess putting him up in the higher corral worked to his benefit and he ran a great time. With the afternoon being full of activities for our boys on Halloween we didn’t really have much time to stick around. The headline act at this Rock ‘n’ Roll race was the Gin Blossoms. My wife knows their music as I think they were big in her high school or college years. I was still in England in those days and was unfamiliar with them so I wasn’t too upset either way. I’m sure it would have been a fun event. What was nice about the medal this year (after finally using nice ribbons last year) they actually themed the medal around the change in date and it had a Halloween theme to commemorate the event being run on October 31st. Nice touch Rock ‘n’ Roll group.